You are here: HomenextPlacesnextShops and businessesnextDo you remember the shop?nextWhat did they sell? Well – do you remember this shop? What did it sell? Where was it? If you can enlighten us – please leave a comment below. Click on the photograph to open a large version in a new window – click again to further enlarge. Still selling food and cakes today! I think it might be St James’s Street on the right-hand side going up, it’s a bakery shop. Have a feeling it was later a Giggins shop. Clearly a baker’s shop. Feel certain I’d have purchased an iced bun there at times. Wasn’t this St. James’s Street? I seem to recall a draper shop on the right hand side going up…as this picture suggests. Curious to hear from others. I think this is 120 St James’s St and the drapers is 119. Now the Bombay Mix restaurant. 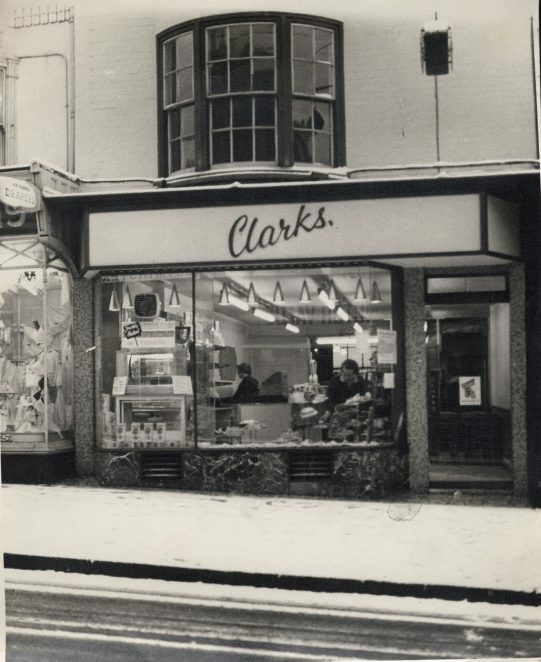 This is definitely Clark’s Bakery at 120, St. James’s Street, next door at 118/119 being the Draper’s shop of H.R. Harris Ltd. Clark’s Bread Co. were a well established Bakery chain, having a large number of branches throughout the area. Their head office was at the Goldstone Bakery, Newtown Road, Hove. I worked here in the 60s, amongst other Clarke’s shops. I worked on a Bank Holiday at the height of the mods and rockers invasion. I was sent with a tray of sausage rolls to the Clark’s corner of New Road, they had run out. Funnily enough, so had I, as I walked up North Street! Suddenly I was surrounded by mods and police. A policeman had his helmet knocked off. As a young sixteen year old, I have to say, it was a frightening experience. I remember this Clark’s shop; my friend’s mother use to work there, her name was Connie Marchant. If I remember rightly, next door on the corner was an undertakers. I think it was on the corner of Manchester Street. Sandra is right, there was a drapers shop next door. This picture is of Clark’s the bakers on the corner of Manchester street. My mother was manageress there in the 1930s. One of the many stories she has told me relating to the shop was of Max Miller. He would come in on a Saturday morning and buy two bath buns for him and his wife. He would then proceed to tell the most rude joke he could come up with just to watch the girls blush! One other story was that the area manager would travel around the town to check that the window displays were not cleared away before the shop shut at 7pm! If any trays were found to be removed early wages were docked that week! How times have changed! I remember this row of shops in St James’s Street, the drapers next door to Clark’s was Harris’s and there was also Chapman’s the Butchers there too. Yes, this was Clark’s the bakers in St James’s Street, on the corner of Manchester Street was Ashton’s the undertakers and number 117 was Chapman’s the Butchers. 118/119 St James’s Street was next to Clark’s bakery shop. My Great Grandfather and Grandfather were both named Henry Robert, hence the name H.R.H Harris’s Draper’s, and my Father sold the shop’s in 1974. It was a sad day as it had been in the family since 1899. 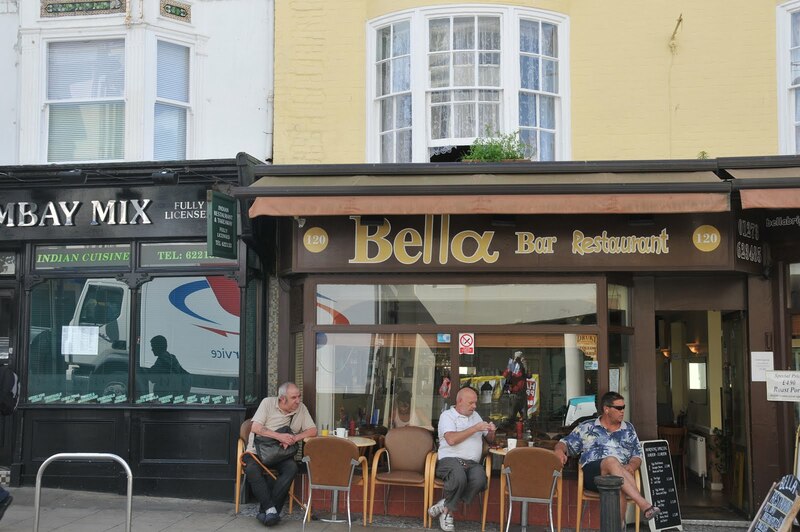 My Grandparents lived in the flat above one of the shops, I have so many happy childhood memories. My Grandmother would sometimes take me into Clark’s and treat me to an iced bun. Time passes and things change but memories stay with you forever. Yes, I too remember this shop. Passed it a month ago, memories flooded back. And the the pie shop. June, can you tell me if you lived off of Trafalger Street about 1957, as I wanted to know? Thanks Pam. Hi June, my sister Carol Brittain worked at Harris’s in the ’60s, I remember passing and popping in to say hello. And my mother always bought our weekly meat from Chapman’s the butchers. Just checked my 1971 Kellys and there was two Clark’s bakers: one at 22, and one at 122. St James’s St.
My Mother worked there during the war, she was also a war bride marrying a Canadian. I was just 7 years old in 1960 when my mum took my sister and I back to visit my Grandmother who lived on Roedale Road. I do remember walking to Clarkes passing under a viaduct maybe. Mum visited the old place and told us stories. Am going back to Brighton this summer for the first time since then, am now a young 60.. I have a silverplate preserve spoon made by the prestigious Mappin & Webb Co. stamped with Clark’s Bread Co. Ltd on the handle. Did they have tea rooms in the shops? Clarke’s bakery had shop in London road, they sold the most delicious jam cake which I still dream of 60 years on. I have just found two Clark’s bag’s under my house. Which I think are from 1964! How do I upload photos?